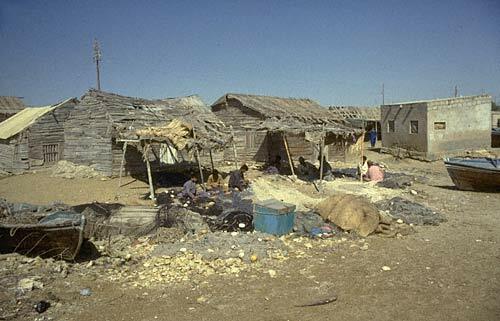 Between 1993-1994 I lived and worked in a small Baluch fishing village near Hawkes Bay, Abdur Rehman Goth, just west of Karachi, Pakistan (goth is the Baluchi word for village). My main research goals were to conduct an ethnoarchaeological study of traditional fishing and butchery practices. Ethnoarchaeology is the study of modern human activities to develop models in order to understand and interpret the archaeological record. My primary goals were to interpret fish remains recovered from various sites of the Indus Valley Tradition (3,300-1,700 B.C.E. ), including the marine sites of Balakot and Allahdino. Two modes of fishing occur along the eastern Makran coast: near#45;shore fishing and inshore fishing. Each of these strategies requires different types of nets and strategies, described below. Each of these strategies exploits a specific type of environment and, therefore, focuses on a specific group of fish. Additionally, during the major weather changes of the summer monsoons, stronger nets are used due to sea surface activity. This photograph depicts an older home that has been converted into a net storage and work area. The fishermen are repairing nets after the morning fishing has been finished.